Women lead busy lives and don't always have the time to stream the lifestyle video content they love when they want. 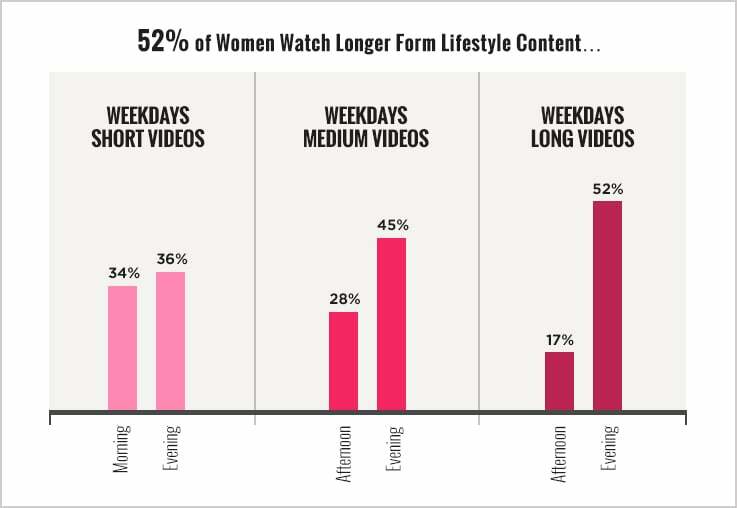 As part of the POPSUGAR Insights/ulive 2014 lifestyle video study, we asked women to detail their consumption of lifestyle video content by video length and by day part to better understand when they are viewing content of different lengths during weekdays and weekends. We segmented the video lengths into short (less than four minutes), medium (between four to 20 minutes), and long (20+ minutes) and the day parts into morning, afternoon, evening, and late night (after 11 p.m.) for both weekdays and weekends. Women were also able to respond when their viewing habits of the content lengths varied. During weekdays, women are consuming short online lifestyle videos in the evening (36%) and the morning (34%). Among avid female consumers (those women who stream 240+ minutes of lifestyle video content per month), morning ranks first (44%), followed by evening (32%) and very closely afternoon (31%). These avid women are streaming lifestyle content all day long but prefer to stream shorter videos in the morning, perhaps as they seek inspiration for their daily workout, today's outfit, or what to make for lunch later in the day. Women who stream medium-length lifestyle videos are less likely to watch in the morning (15%), preferring to stream in the evening (45%) or afternoon (28%), perhaps when they have more free time to enjoy the content and replicate the experience. The majority of women who stream long-form lifestyle video content prefer to watch in the evening (52%), followed by the afternoon (17%); again, perhaps they seek the free time in their day to watch the entire video in one sitting and enjoy a little "me" time. Nearly 30% of women who watch long-length lifestyle videos said that the time of day they watch videos of over 20 minutes in length can vary. On the weekends, we found that the time of day that women stream all three lengths of video content varied quite a bit. Forty-four percent of women who stream short videos, 41% of women who stream medium videos, and 37% of women who stream long videos said that the time of day when they watch varies on weekends. Of those women who did specify a particular time of day, short videos were most often watched in both morning (26%) and evening (26%), and medium videos (32%) and long video (29%) were most often watched in the evening.